What a wacky weekend we've had weather-wise! Saturday was amazing and all I wanted to do was go walking outside. On Sunday I opted for a gym workout as I didn't want to be outside in that slushy mess! I wanted to share a picture I found that really stuck with me. One that I can completely relate to because I've been there. 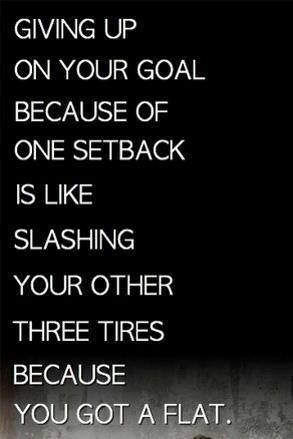 I've given up on a goal just because of a single setback. That setback pushed me so far back I just spiraled and spiraled out of control. That led to me gaining a lot of weight back and losing every single healthy habit I had. It sucked. But that's life and you learn. Next time I think about giving up or throwing in the towel I'm going to remember this picture and not let myself do it. You've got to do it for yourself!